Gluefast offers the best liquid Lay Flat Glues and adhesives for labeling and mounting applications. Our water-based products have high solid and tack (stickiness) strength, a long "open time" allowing the operator ample time to properly position the label, and a smooth finish quality. When these water-based adhesives are used with our Colonel Gluer Adhesive Applicator and Adjutant Press Mounting Press, we call this team the Wrinkle Tamers! Together these products constitute an efficient labeling and mounting system suitable in the most demanding industrial and commercial operations. Using our lay flat glues will save you 80% or more compared to the heat-seal method of mounting! See our Guide to Labeling and Mounting Adhesives for a listing of our full line of Glues for manual, electric, and automatic gluing machines. 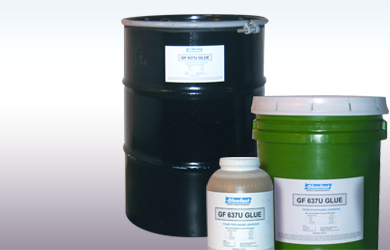 Below are two of Gluefast’s most popular types of Lay Flat Glues and their product-specific information. Applications Suitable for a variety of high performance applications that require good machining characteristics. Suitable for a variety of high performance applications that require good machining characteristics and adhesion to coated materials or wood. Features Excellent lay flat, non-wrinkle characteristics with good penetration into board stock. As a slow drying adhesive, it allows for repositioning. Excellent lay flat, non-wrinkle characteristics with good penetration into board stock. 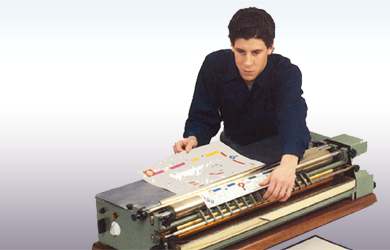 Adhesive Application Equipment Manual and electric tabletop label gluers. Can be applied using a paint roller and a small amount of adhesive (to avoid wrinkling). 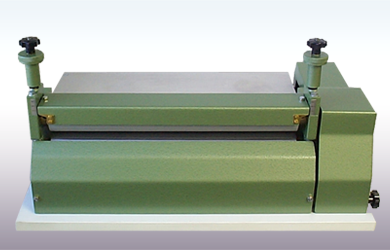 Manual and electric tabletop label gluers. Can be applied using a paint roller and a small amount of adhesive (to avoid wrinkling). FDA Status Ingredients comply with regulations for use in Food Packaging Adhesives as per regulation 175.105. Ingredients comply with regulations for use in Food Packaging Adhesives as per regulation 175.105. 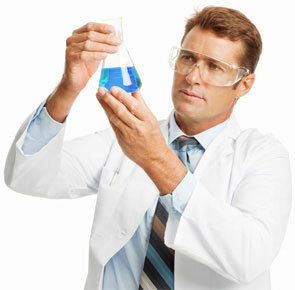 Cleanup Solvent Water or soap and water. Water or soap and water. Storage Conditions Store at room temperature. Rotate stock using oldest material first. Shelf life is six months. Keep from freezing. Store at room temperature. Rotate stock using oldest material first. Shelf life is six months. Keep from freezing. *NOTE: Surfaces and information above are suggestions only. Final tests for suitability remain the responsibility of the user. 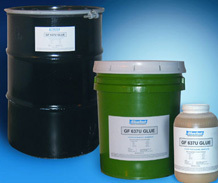 Gluefast’s Lay Flat Glues are available in gallons, 5-gallon pails, and 55-gallon drums. Expected yield of 75,000 square inches of glue per gallon can be achieved when used in manual or electric label gluers such as those offered by Gluefast. When used with the Gluefast Label Pro® Label Gluer yield is up to 150,000 square inches of glue per gallon! Contact one of our representatives for more information and we’ll help you find the Lay Flat Glue that is guaranteed to work well in your adhesive application.